Saint Corporation is a mega-corporation like one would find in any cyberpunk or dystopian future. They have their roots sunk deep into much of Void City's economy and only now that their web of control is vast are they starting to pull strings. The Corporation's clean side is that of a well to do Pharmaceuticals company that produces prescription drugs and medical tools. They then turn around and use their products to control the entire illegal drug industry with in Void. Everything from Ecstasy and Cocaine to designer drugs and experimental synthetic blends. They function much like a mafia, protecting the city and manipulating the shadow culture and underground. Daine's style of business seems to be that of brutal honesty. Saint Corp does seem to effectively handle protection and defense from petty crime where VCPD fails. Many shops and neighborhoods willingly pay the company protection fees of their own free will. Daine Saint, CEO, founder, and largest share holder in the corporation. He calls the shots. A honorable and surly man, its rare to see him outside of his office. A shrewd and ruthless businessman, Daine wastes little time with the media or public eye. He walks with a limp and is missing an eye, there are rumors that he is a retired Fighter. He wants nothing more than to have VC in the palm of his hand, though the reasons are unknown. 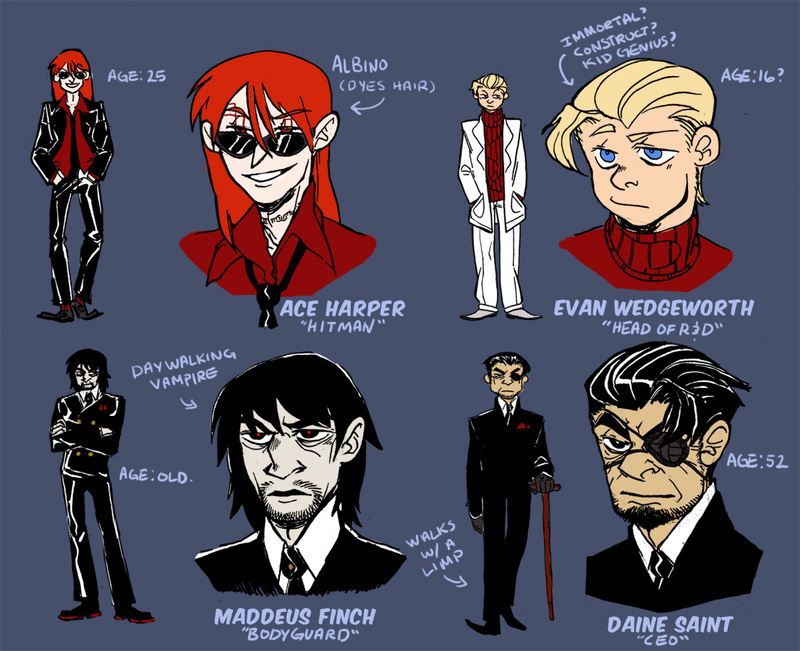 Maddeus Finch acts as bodyguard to Mr. Saint and occasionally as a hitman. The man is a vampire, not that uncommon in Void. Maddeus's sheer age though has made sunlight merely an annoyance. His interest in human affairs seems detached at best and his own friend seems to be Evan. Its curious to note that his friendship with Evan seems to be much older than Evan's age should allow for. Evan Wedgeworth is the current head of Research and Development. His understanding of the human body seems almost endless. Much of the innovation that allowed Saint Corporation to quickly become top dog of the medical world is thanks to him. His young age seems illogical, and is likely some kind of facade hiding a secret. Evan is hard working and endlessly curious, as well as lacking him the typical morals that would prevent harsh experimentation. Ace Harper acts as the main hitman and muscle for the Corporation. Covering his association with the company with the facade of being a trust fund baby who happens to have the second highest shares in the corporation, he enjoys playing with the media and basking in the limelight as a target for gossip rags. In reality he spends much of his nights playing bruiser and handling all the important dirty work. -I don't expect you to use all four characters, you can if you want but there is no obligation to. -Evan works nights in the Void City Hospital's Emergency Care ward. -Daine uses a shotgun if he has to fight. -Ace is an albino, he dyes his normally pigment-less hair a bright red. -Sunlight doesn't bother Maddeus beyond needing a pair of sunglasses.